Description - This small bird can be identified by its black cap and bib and white cheeks. The back is grey with white underparts; the wings are edged with white. Their characteristic call is a buzzy "chick-a-dee-dee-dee". Distribution - The black-capped chickadee ranges throughout all of Canada. They inhabit deciduous and mixed forests and open woodlands, often wintering in suburban areas. 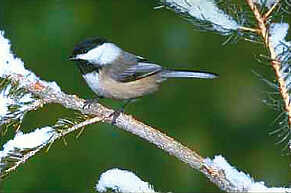 Biology - The black-capped chickadee feeds on insects, seeds and berries. They prepare their nest with grass, fur, plant down, feathers and moss in a hole in a rotten tree stump, a natural cavity or a bird box. This bird is constantly active, either hopping, clinging or hanging from tree branches.